HERE for an 8x10 copy of the reunion photo. Do you have photos or commentary about the reunion to share on this Web site? If so, send to Sue Pearson at Sueharmony09@gmail.com. The reunion started off on Friday night, September 26, 2008, with a large gathering at “The Wheel” for beer and pizza. A beautiful and warm evening and lots of friends greeting friends. Memory Books were distributed that evening as well as information on the next couple of days' events. Saturday morning began with a tour of Lawrence High School, led by the principal (who was once a student of Nancy Vogel's). Classmates then loaded up for the drive to Eudora for a catered barbecue luncheon in the home and yard of Sue Fulcher (now Mrs. Monte Pearson!). The lunch was catered by Bigg's Barbecue (owned by Linda Large-Weis' son) Lots of time to visit with friends and get caught up on their activities over the past few years. Another warm and wonderful day...how lucky we were! A little free time to return to homes or hotels to read up on the Memory Book before heading to the Lawrence Country Club for a memorial balloon release (50 of our classmates are deceased). We also took a group picture and had a delicious dinner and a D.J. for dancing. Larry Hatfield and Andy Graham kept the evening moving along with their commentary. The historic Eldridge Hotel was the site of our Sunday morning brunch. 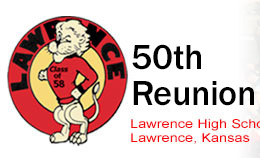 It was attended by about 70 classmates and spouses and this brought the LHS 50th High School Reunion to a close. If anyone has ideas on how we can be planning on our 55th (what you would like to see included), let the reunion committee know through Sue Fulcher-Pearson at sueharmony@sunflower.com. And, of course, if you want to BE on the committee to help, let her know also. We had a wonderful weekend with everyone. The four events gave us time to visit and get reacquainted. Two of the events were outside and we had wonderful weather to complement it.